If a zombie apocalypse comes, I know where I’m seeking shelter: bartender Joseph Brooke’s Mid-City home bar, the Barage. 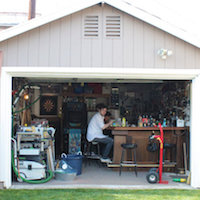 Stocked with power tools, custom weaponry, and booze it’s the place to pass the end of days. The polar opposite of the last home bar I wrote about, Rachel Furman’s Whiskey and Smoke, this is a dude’s workshop. Tools hang on pegs on the wall alongside cocktail strainers and Red Solo wine glasses. There’s a champagne saber, a custom-made ax, and a Woodford Reserve wooden mallet serving as a sort of 3-D coat of arms at the Barage entrance. And it’s not tidy here. Bags of unroasted coffee beans as well as home brewing paraphernalia are strewn about. The bar stools, rescued from the very first bar Joe worked on for Bar Rescue, are an explosion of vinyl and stuffing. The coasters are made from roughly hewn squares of peg board. “The margin for error here is pornographically wide. It’s not for perfection,” said Joe. But Barage is so awesome. Joe built track lighting over the bar, a full-size refrigerator keeps vodka and gin chilled for Salvatore’s Martini, and the bar even has purse hooks. Three years in the making, it’s the best use of garage space ever. I mean, the car can live on the street anyway. Plus here, Joe has a place to experiment on cocktails, brew his own beer and roast his own coffee beans. “It’s equal parts lab and sandbox. But also it’s a great place to go at the end of the night. It’s quiet, I’m not waking [my wife] Jen up. It doesn’t get cold since I’ve insulated it. It does get chilly but if you have a couple of bodies in here that’ll warm it up,” said Joe. Future plans for Barage include turning it into a tutoring space as well as having movie nights during the summer. Previous articleL.A.’s Next Coast: Will The Silver Lake Reservoir Become a Beach?